This is the debut release by a fellow from L.A. named Glen Adams, and on this he flirts right on the edges of what I like about ambient synth music and what drives me nuts - namely, the need to “spice things up” by adding all kinds of other influences. If you are gonna float then just do it! To whit, the second track, “Orbital Bop”, is exactly what you might guess from the title - spacey jazz-fusion. Miles Davis this ain’t, which is too bad. Things also veer a little too close to ambient techno (is that a genre? Hell I don’t know…) on “Tortured Souls”. On the positive side, when he loses the beat and just floats (“Journey”) things get quite nice, and toward the end of the CD some of the more dissonant tracks such as “Way Out There” and especially “Black Nebula” are really excellent, and reach the Hearts Of Space vibe that Mr. Adams is pretty obviously after. Galactic Anthems is a mixed bag, but there is definitely some interesting motion. 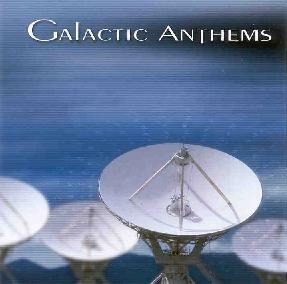 For more information you can visit the Galactic Anthems web site at: http://www.galacticanthems.com. Contact via snail mail c/o Galactic Anthems; 762 Saint James Drive; Corona, CA 92882.